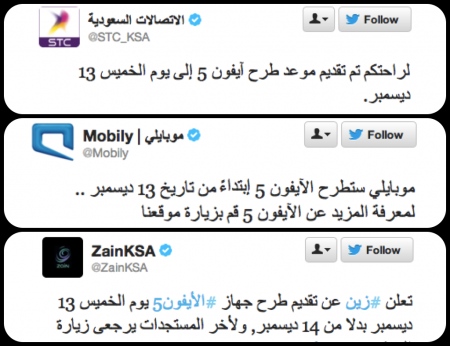 STC, Mobily and Zain all has announced via Twitter that they have moved the iPhone 5 launch date in Saudi Arabia from December 14th to Tuesday the 13th of the month. The iPhone 5 will most likely be the A1429 model and currently only supports Zain’s 4G LTE network. FaceTime is expected to be disabled on these iPhones as well.